While the origins of the Chow Chow remain unknown, they are an ancient breed which has lived in the southern provinces of China for hundreds of years, possibly thousands. They may have served as pointing dogs for the nobles, or they may have been bred for their pelts and meat in Manchuria and Mongolia. The name Chow Chow was first assigned when the dogs were imported to England in the late 1700’s, and means ‘nicknack’, probably because the breed was seen as an oriental curiosity (the name may have even been taken from the boxes in which the dogs were shipped). In China, the breed is known as a ‘Songshi Quan’, meaning ‘puffy lion dog’. Queen Victoria’s fascination with the breed drew increased attention to them, and beginning in the 1800’s many were imported to America. Chow Chows rocketed in popularity in the 1980’s, becoming America’s sixth most popular breed--but they are still eaten today in some areas of China. The Chow Chow has a shoulder height of 46-56 cm (18-22 in) and weighs 20-32 kg (45-70 lbs). They are known for their blue-black tongues. 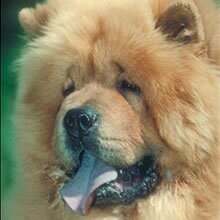 Chow Chows are sturdy and square from a profile view, with large, wide skulls, small triangular ears, and padded tufts of skin above the eyes. Chow Chows have round feet and large, fluffy tails which they carry on the back. Their back legs are unusually straight, giving them a distinct stride. There are two Chow Chow varieties: those with long, straight, and rough coats and those with short, smooth coats. Both coats are very dense and are thicker around the neck, giving the appearance of a mane. The Chow Chow may be any solid color, but should not be multicolored. Common colors are red, black, blue, and cream. The Chow Chow is an independent dog that is calm and vigilant. It is a huge, puffy, lovable friend with abundant character. It is territorial, and may try to dominate other dogs on its home turf. If the Chow Chow doesn’t detect a ruler of the pack it will step in to fill the void, so a successful Chow Chow owner must be dominant. Chow Chows may spend a lot of time by themselves. The Chow Chow is an independent dog that is calm and vigilant. It is a huge, puffy, lovable friend with abundant character. It is territorial, and may try to dominate other dogs on its home turf. If the Chow Chow doesn’t detect a ruler of the pack it will step in to fill the void, so a successful Chow Chow owner must be dominant. Chow Chows may spend a lot of time by themselves. Although domineering around other dogs, Chow Chows are usually good with children. They should be socialized with other household pets early in life. They are cautious with strangers, but not aggressive. You can find Chow Chow puppies priced from $600 USD to $3500 USD with one of our credible breeders. Browse through our breeder's listings and find your perfect puppy at the perfect price. Although domineering around other dogs, Chow Chows are usually good with children. They should be socialized with other household pets early in life. They are cautious with strangers, but not aggressive. The Chow Chow should be brushed thoroughly on a regular basis. Chow Chows are highly susceptible to elbow dysplasia and should be screened for a variety of diseases such as knee and hip problems. They have a life span of 13-16 years. The Chow Chow is not known as the most obedient dog in the world, but some will learn quickly. Some experts say the short-haired variety learns faster than the long-haired variety. In either case, training must be consistent and firm. Some Chow Chows may be resistant to leashes and collars. The Chow Chow does not need a lot of exercise, but prefers to be outdoors. A daily walk or fenced in yard should be sufficient. The Chow Chow needs a cool place to rest in the summer because it does not like heat. Chow Chows are well suited to apartment life. Chow Chow Puppies for Sale - Shipped Worldwide! Finding the right Chow Chow puppy can be dog gone hard work. PuppyFind® provides a convenient and efficient means of selecting and purchasing the perfect Chow Chow puppy (or Chow Chow puppies) from the comfort of your home, 24 hours a day, 7 days a week. Take advantage of our PuppySearch or leisurely browse our directory of hundreds of dog breeds, Chow Chow dog breeders, Chow Chow dogs for adoption, and Chow Chow puppy for sale listings with photos and detailed descriptions. Some Chow Chow puppies for sale may be shipped Worldwide and include crate and veterinarian checkup. Many Chow Chow dog breeders with puppies for sale also offer a health guarantee. With thousands of Chow Chow puppies for sale and hundreds of Chow Chow dog breeders, you're sure to find the perfect Chow Chow puppy.